Jack Lovelock led a remarkably full life before his death, just a few days shy of his 40th birthday, on 28 December 1949. He is remembered in New Zealand and abroad largely for his athletic achievements, especially his dramatic finish in the 1500 metres at the 1936 Berlin Olympics, which won New Zealand its first athletics gold medal. But Lovelock also achieved academically, forged a successful medical career and was a husband and father of two. Lovelock’s achievements and untimely death at the age of 39 have captured the imagination of New Zealanders and others. Streets, playing fields and sports bars have been named after him. He has inspired books, stamps, a stage play and a film. In 2002 a statue was erected at Timaru Boys' High School, where much of the memorabilia related to him is stored. From his early days at school Lovelock participated and excelled in fields beyond athletics. At Fairlie School (1919-23) he was dux of the primary school, represented the school in rugby, competed in swimming and athletics, and was a prefect. At Timaru Boys’ High School, which he attended as a boarder from 1924, he set school athletics records but was also involved ‘in nearly every area of school life'. In 1928, his final year, Lovelock was dux, head prefect, and won the school’s boxing championship cup. The following year he went to the University of Otago to study medicine. He again impressed and, when he had been at university for less than two years was awarded a Rhodes Scholarship. He attended Exeter College, Oxford, from 1931 to 1934. Lovelock would undoubtedly have performed better academically at Exeter had it not been for his busy athletics schedule. 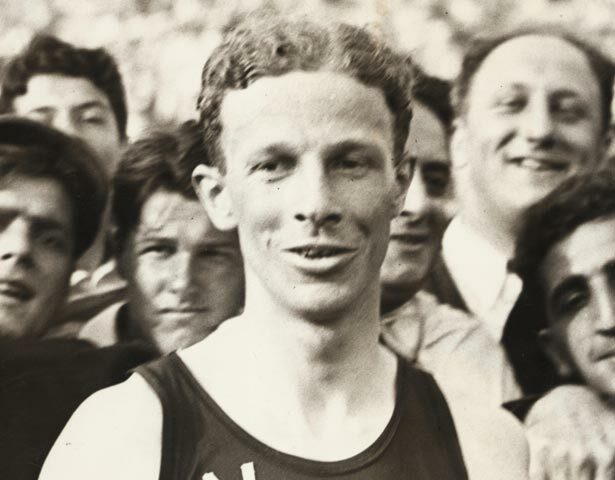 While a student he broke the British mile record (1932), competed in the 1932 Olympics, set a world mile record (1933) and won gold at the 1934 Empire Games. He was also involved in other boxing and debating. While the college recognised his all-round achievement with the Quarrel Read prize in 1933, Lovelock was disappointed with his academic performance. When he was awarded third-class honours for his BA in physiology (1934), he noted that most Rhodes Scholars achieved at least second-class honours. Lovelock was also struggling with his own medical issues during this period, having suffered knee problems since 1933. Two months after his Olympic victory he competed in another ‘Mile of the Century', finishing second to 19-year-old Archie San Romani in his last major race. His medical problems continued after he retired. In 1940 and 1941 he suffered a series of head injuries. The best documented was caused by a fall from a horse in September 1940, which left him unconscious for at least two days. Dizziness and eyesight problems continued to affect his life and may ultimately have contributed to his death. In 1945 Lovelock finally married Cynthia Wells James, an American whom he had met in England, probably in late 1937. Their long engagement was no doubt influenced by Lovelock’s work schedule, financial position and the outbreak of war in 1939. In December 1947 they and their infant daughter, Mary, moved to the United States. Lovelock took up a position at the Hospital for Special Surgery in Manhattan, working in rehabilitative medicine. Their second daughter, Janet, was born in 1948. Dedicated to the end, Lovelock went to work early on 28 December 1949 despite being unwell. At 9.30 a.m. the secretary of his department rang his wife to say he was returning home. While waiting at the Church Avenue subway station Lovelock fell beneath a train and was killed instantly. We have 3 events in history, 6 biographies, 1 article, related to Jack Lovelock.